By Lars Nordenlund Friis, VP, Incubation & Ventures at Milestone Systems. The time to reinvent your business is now. Cloud-driven digital transformation and the Internet of Things (IoT) are emerging as major drivers of change across entire industries like public safety, retail, transportation, hospitality, manufacturing etc., with massive implications on business models, workflow management, systems and people. Lars Nordenlund Friis, VP, Incubation & Ventures at Milestone Systems. As I described in an article Everything Connected (https://www.linkedin.com/pulse/everything-connected-now-time-reinvent-your-business-lars?trk=prof-post, the innovation drive and opportunities are huge. Incremental updates on well-known frameworks will not be enough to maintain your competitiveness or even remain relevant in your market. This might be time for a big strategic change. To take full advantage of new, cloud-based IoT opportunities, todays companies must fundamentally rethink their approach to value creation and customer-centric offerings. I view the innovation effort and approach in cloud IoT as a major Blue Ocean market opportunity. The Blue Ocean strategy concept is all about leaving the bloody red ocean of rivals fighting over a shrinking profit pool and venturing into a new avenue of success. And that increasingly comes not from battling competitors, but from creating blue oceans of untapped new market spaces ripe for growth. Your company could be the one to break the value-cost trade-offs, redefining your industry by eliminating the factors the industry has taken for granted, but create no value for customers. Imagine how you can design services and business models that introduce new factors never seen before, or elevate the factors that truly create value beyond current standards. Its not easy to do, but if you are not doing it, someone else is probably doing it to you. The internet has enabled the as a service business model for IT infrastructure and software. The IoT enables anything as a service business models for all kinds of traditional products. As a result, companies are shifting from selling products to offering services-based subscriptions that create more value for customers. Even your doctor can be a cloud service in the future. IBM is working on a way to make its Watson supercomputer a far more effective medical tool for flesh-and-blood doctors by analysing medical imaging data to learn what a healthy set of insides looks like. If this data is merged with each patients medical records, it could mean faster and more effective treatment for serious conditions. On the same mission, CognitiveScale is a cloud-based startup in Austin, Texas, founded by some people behind IBMs Watson. They develop big data interpretation and machine learning systems for better decision-making. Last year the company launched a health-care group to apply its technology to managing data from patients with chronic conditions such as cancer and respiratory ailment. 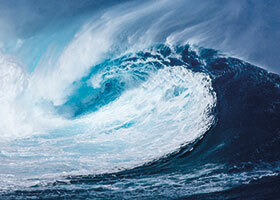 This Blue Ocean innovation is just one part of the technology waves that can transform your companys value proposition, technology strategy and operational process model. Digital transformation expands businesses. For example, todays video security camera performs surveillance to prevent crime and provide evidence for investigation. In a cloud and everything-connected future, companies can scale much further into business optimisation and value creation for customers. Beyond security. Camera sensors can monitor activity like people, cars, situational awareness at multiple customer sites, aggregating data analytics not possible in todays dispatched on-premise systems. Deep learning techniques can dramatically improve the video search experience in evidence handling, just as advanced behavioural analytics can enhance video surveillance to prevent incidents like terror attacks, city crime and public safety at events. Makers of industrial equipment like the redefined GE, The Digital Industrial Company, can shift from selling capital goods to selling their products as services. Sensor data will tell the manufacturer how much the machinery is used, enabling the manufacturer to charge by usage. Service and maintenance could be bundled into the hourly rate and change the entire business model. The service model also enables automatic upgrades of software in an always-on scenario, introducing design and optimisation of new process flows where value is created for customers. This data will ultimately help the manufacturer, transportation, hospitality service provider or retailer to save on cost of operations and increase revenue through cross-selling additional products and services. How is this transformation going to play out? There is a lot of uncertainty, and I see the IoT evolving in the way that many technology trends do: at present, were at the peak of hype, topping the inflated expectations on the Gartner curve. Were still a few years away from the IoT as a pragmatic, productive reality. The first wave is On-premise analogue and IP video management. Since the 1950s and the traditional analogue CCTV video application, security cameras capture an analogue video signal and transfer it over coax cable to the digital video recorder (DVR). Then IP video started to take over in the late 1990s, with Milestone Systems as a pioneer, because of better image quality and scalability in a distributed architecture. It has been a very slow market transition. Today the IP market has just surpassed the analogue video equipment share with 60% IP vs 40% analogue. The trend toward IP dominance is clear, and in massive on-premise deployments its expected to be the preferred solution in most industries for a long time. The second wave is Video surveillance as a service and big data analytics. This will accelerate the transition from analogue. It centres on video cloud computing, the management of data aggregation and presentation of video analytics. In a recent market research paper from Forrester, 58% of the respondents say that customer analytics is the most important technology investment in the next 12 months, and 31% mention cloud as the preferred deployment option. This will happen in a big way with traditional analytics and machine learning aggregation, as mentioned earlier. The advantage and reason for accelerated market adoption is that the cloud infrastructure scales without limits across sites and geographies by enabling distributed cloud-interconnected systems that can ensure the right level of data on the edge as well as in the cloud. The limiting factors at this stage of evolution are, of course, bandwidth constraints and security concerns. Also the fact that even after enabling cloud integration for storing, archiving and processing video sensor data, it can prove difficult to convert it into useful actionable intelligence. But that is a challenge that currently is being addressed by many startups and established corporations. We see early adopters ready to enter the enterprise segment with entirely new Blue Ocean value propositions based on Video Surveillance as a Service (VSaaS). The third wave of transformation is The IoT on unified platform. At this stage we just add more IoT sensors to cloud video management and provide a unified integration and presentation of data. This platform is the lead into a business optimisation scenario where the video IoT creates significant value for customers and expands market opportunities for systems integrators and manufacturers, to provide better business optimisation and customer-centric businesses. Those who understand IP, cloud and the digital transformation opportunities will be in demand for providing new game-changing services, installing and integrating IoT with video at the core to visualise, manage and verify it all. Just jump onto the wave or start creating it yourself. Then take the fast-swim lane to market leadership. This article was first published on LinkedIn on December 1, 2016.